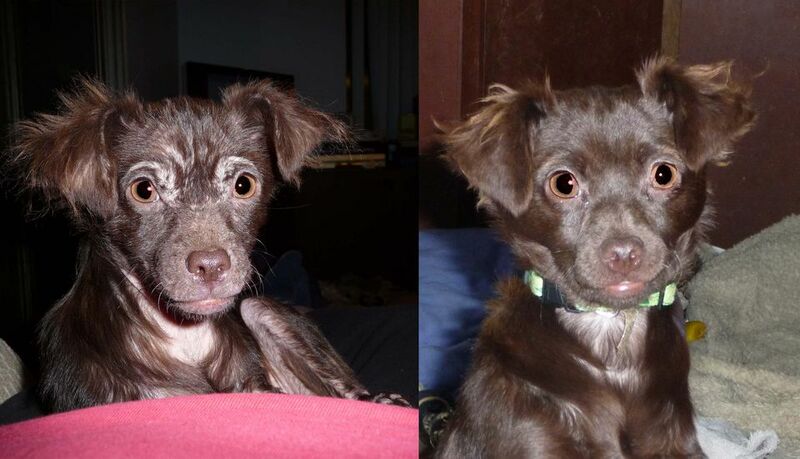 Gizmo: Before & After Demodex Treatment. Demodex mites are microscopic normal inhabitants of dog skin. In a healthy animal, the mites are few in number and do not cause skin problems. In some cases, though, the mites can take over, leading to a condition commonly called "mange" or demodicosis. Learn about the types of mange and various treatment options for this skin parasite. Demodicosis can be localized - small patches affected - or generalized - large areas of the dog's face, feet and body are affected. Many young dog cases "outgrow" demodicosis on their own, without treatment. This is because the immune system develops, gets stronger, and keeps the Demodex mite population in control. Some puppies need veterinary help to overcome the demodicosis. Adult dogs: If an adult dog breaks out with demodicosis, your vet will want to look for reasons why the immune system may be weakened. Possible reasons include cancer, hormonal imbalances (thyroid, Cushing's disease), prolonged corticosteroid use, or immune system changes due to old age. The microscopic Demodex mite lives deep in hair follicles. Diagnosis is suggested by the skin lesions and confirmed with a skin scrape and microscopic examination of Demodex mites. The vet will gently squeeze an area of the skin and rub a scalpel blade over the ridge of skin to collect mites to look at under the microscope. This doesn't hurt the animal. Itchy pets may even appreciate it. Canine demodicosis not contagious to humans. The mites are species-specific, meaning they stay on dogs. This mite is passed mother-to-pup and possibly dog-to-dog, but for animals with healthy immune systems, this doesn't cause disease. Treatment options vary widely based on the severity of the case and the veterinarian's preferred protocols. In some cases, a medicated shampoo and "watch and wait" approach, and for others, a battery of treatments is required to bring the mite population and skin infection under control. Mild/localized cases: Shave affected areas. Wash skin with a benzoyl peroxide shampoo to help "flush" out the hair follicles and keep secondary bacterial infections under control. And "old time" treatment for localized demodicosis is a product called Goodwinol ointment, which contains rotenone, an insecticide. The efficacy (usefulness) of this treatment is a topic of debate. I don't feel that Goodwinol does much for the demodicosis. It may irritate skin. Generalized cases: Like the localized cases, shave affected areas and wash skin with a benzoyl peroxide shampoo to help "flush" out the hair follicles and keep secondary bacterial infections under control. Ivermectin - considered the best treatment option by many vets. This drug is used off-label for Demodex mites and not to be used in Collies or Collie-crosses. Amitraz (Mitaban) dips - approved by the FDA, but not to be used on small dogs or dogs younger than 4 months. Labor-intensive to apply, side effects possible. Milbemycin oxime (Interceptor) - this heartworm preventative, when used on a daily basis, may be effective against generalized demodicosis. The cost may be a prohibiting factor, however. Promeris/Advantage Multi - have been used with mixed results for demodicosis. Please consult with your veterinarian. Dogs affected with demodicosis should be checked for other parasites (skin, ears, intestinal), be on a healthy diet, and have any other health problems addressed for maximum effectiveness of the demodicosis treatment. Dogs being treated for demodicosis should not be given corticosteroids. Dogs with concurrent bacterial skin infections often need oral or injectable antibiotics.